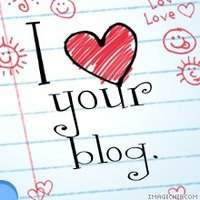 WARNING THIS POST MAY BE BORING!!! 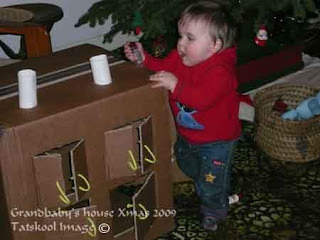 Just before son and 'DIL to be'left after Christmas, little grandson came to stay......for quite a lot of days! They tend to take over our house and our lives. We were warned not to put glass ornaments on the lower branches of the tree......you already saw that I put all the things a baby might like there instead....to remove all spikey and poisonous plants from his reach!!! tho' he tends not to harm plants...being a thoughtful little botanist! She said that his favourites at the moment are...cupboards and their contents...door and handles. 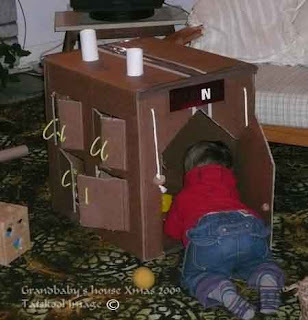 This set me thinking about all the fun we used to have in the old days when my kids were little....with just a cardboard box. 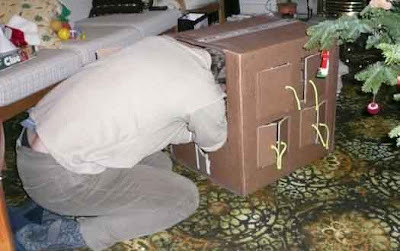 We all know that most kids prefer the box to the toy within. We made a car with all sorts of knobs and dials, a fort with castellated turrets....painted it with thick grey paint mixed with sand, and boy was it gritty. 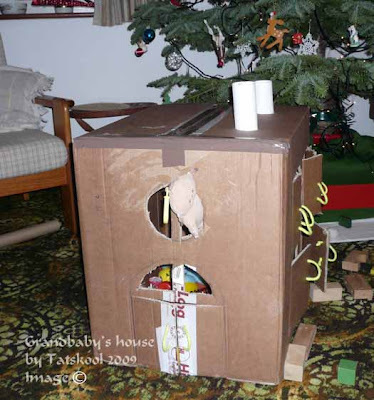 The house elf's Christmas present had arrived in a large very strong box, and that got me thinking.....if he likes cupboards full of plastic, door and handles then that is what he will get. He wouldn't have the strength to open our cupboard doors YET! anyway. So when Christmas day was over....son, 'DIL to be' and I got our thinking caps on. 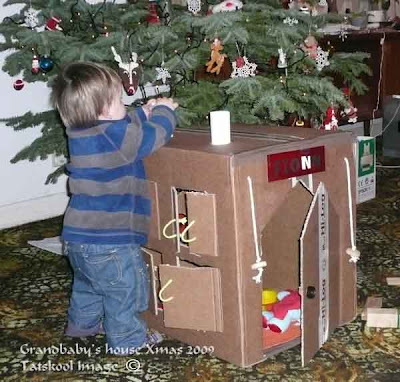 I told them what I wanted and sonny boy drew it out on the box so that 'DIL to be' could cut it out....he being the architect and foreman!! 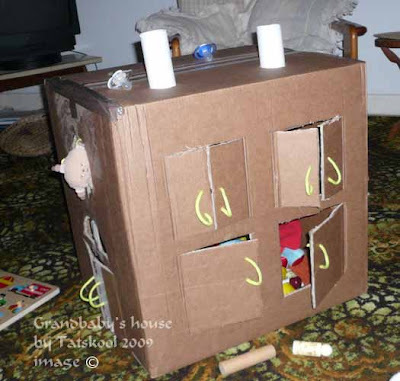 This is the back with little patio doors leading out into the carpet, and a fab circular window....just right for stuffies to peep out or to post things in....and to make it quite bright inside, tho' I am not sure that a baby will go into a cave! One side has 4 windows, 2 single and 2 double....all with lime green little baby sized handles. ...before we add the chimneys. The house is in need of some exterior decoration but that's for later. 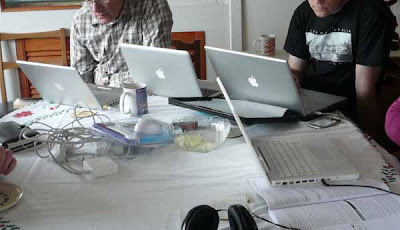 Grandbaby arrived and so did even more computers, this is just 4 out of the 5 Mac laptops to say nothing of the big screens. 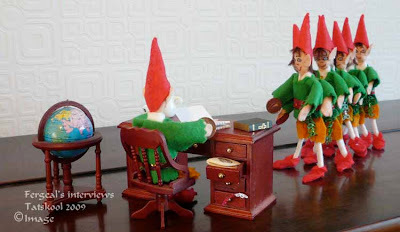 They do bring their work with them...no idle hands in my house! 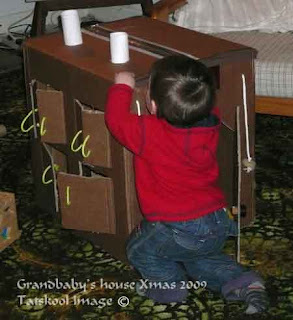 Grandson is now 14 months old, has perfect balance and is quite capable of walking...but he tends to stick to walking round the furniture...always with an object in each hand....preferably his shoes....after all shoes are made for walking. For speed he prefers crawling or his new mode...developed especially to hold an object in each hand...of standing up on his knees and shuffling forward. I decided not to force his house on him but to let him discover it in his own good time. 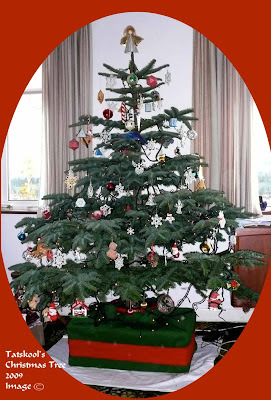 The Christmas tree did fascinate him and every time he approached it his mum would say 'touch' and his index finger would reach out and touch an ornament ever so gently and make it bounce. The house he ignored! just like his wrapped presents he had no concept of what it was. I wondered if this was going to work. Next day we decided to open the main door and tempt him..especially by his stuffies tapping on the little doors from inside and the poking their heads out of different door. 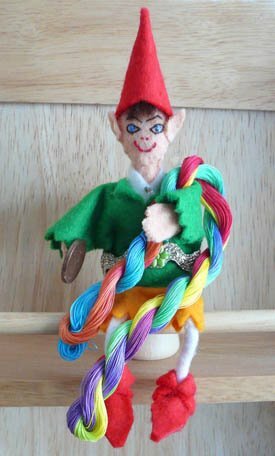 Very soon he was pulling the little handles and giggling. 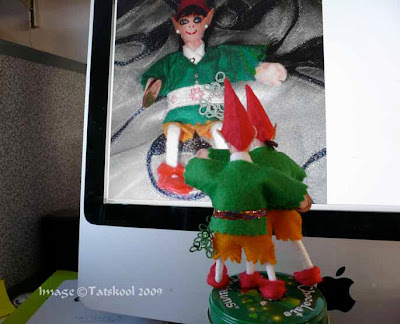 I showed him how I could post little objects down thro' the chimneys on the roof and with in a day he suddenly got it! It's just baby height, cool! 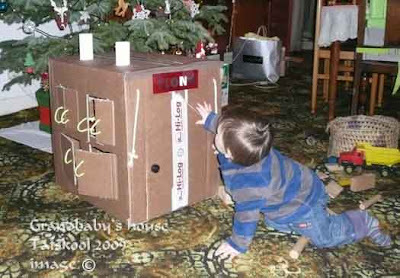 By the 29th he had really got enthusiastic and discovered some of the many pieces inside...but his absolute favourite is to post a little plastic bottle down the chimney, drop to his knees, into the box to retrieve it and do it all over again. I think this is one of his earliest sessions of entertaining himself. Whenever he sees a chimney on a house from now on he will think it is there to post things thro'....bit like Santa really! He is really good at ducking his head to get back out....until one time when he went right in and sat down and then couldn't get his head low enough to get out...design fault in the low doorway...blame the architect!! You will now understand why Life and Thread Dyeing have been temporarily terminated!! I don't know how you guys with little children manage!! Christmas eve. 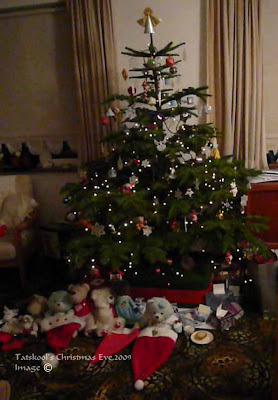 The Santa hats were laid out under the tree, mince pie and a glass of milk for Santa (mustn't turn him into an alcoholic!). The tree twinkled in a way that made my eyes keep turning to look. Christmas morning the hats were full of chocolates and chocolate money....yipee santa never lets us down...you would think we had small children in the house....instead of thirty something children... We hope that we never grow up and lose the magic. 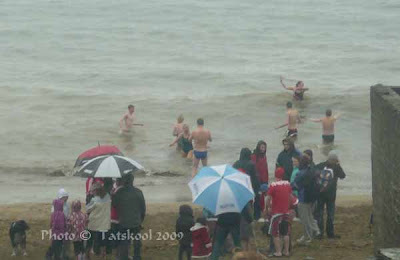 The weather was absolutely atrocious.....going from sheeting rain to hail storms until it cleared enough for us to drive to see if anyone was brave enough for the Christmas swim. 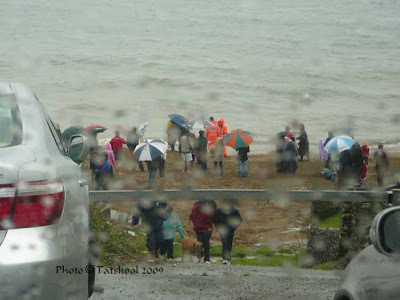 We parked as near as we could and watched from the car as so many raced into the sea....and raced out again. 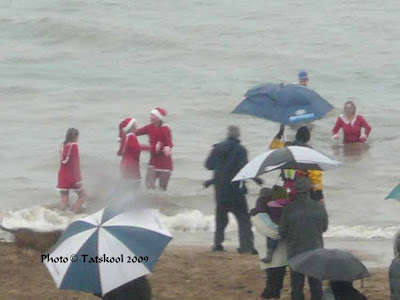 Santa's danced in the icy water. Finally son and I ventured out of the car to get a bit of exercise and fresh air as the rain had stopped for a few minutes. 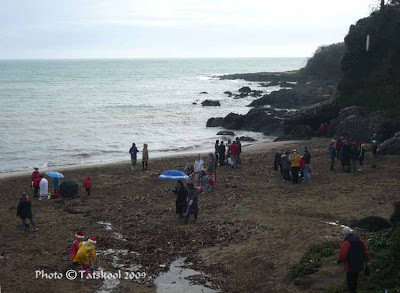 Watching the Christmas swim has been our family tradition for years and years and I don't ever remember such awful weather. I suppose I just don't remember bad things. Hope your day was as good. 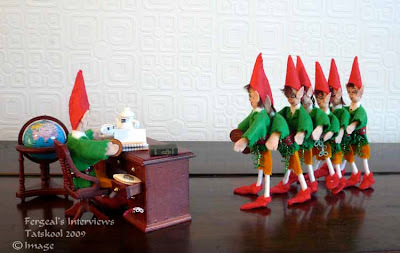 Happy St Stephens day to all my friends. 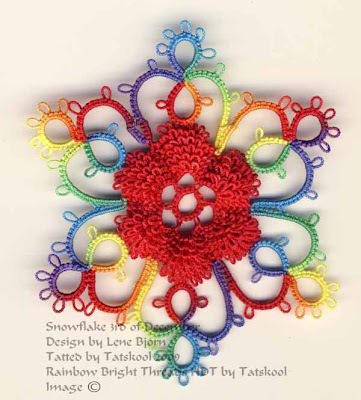 I just offered my son his choice of snowflake (he loves my tatting) and his chose the Rainbow Bright one with the yellow center...I knew he would! 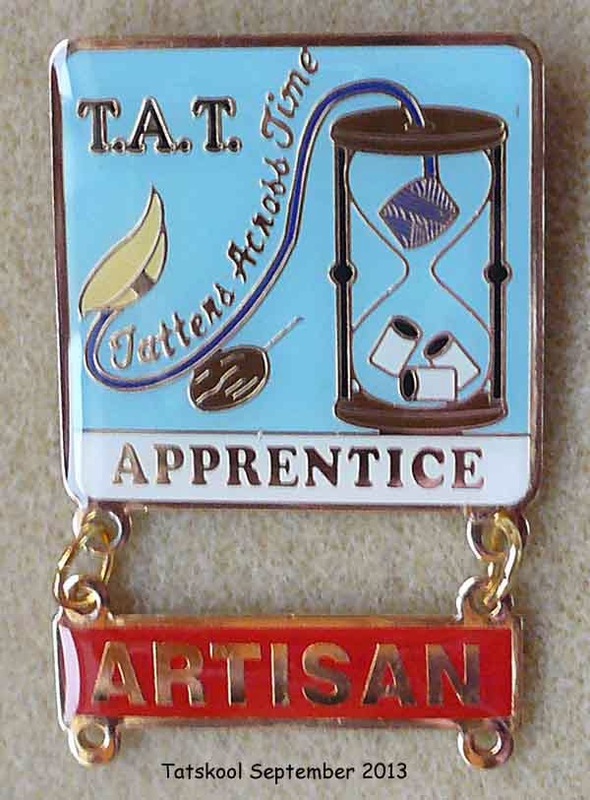 I continue to blunder my way through my challenge, trying to tat as fast as possible....Resulting in so many mistakes which I am happy to show you, tho I would prefer perfection but that doesn't happen first time always....indeed not often! We all have to practice, concentrate and learn. Snowflake number 16 was no exception! 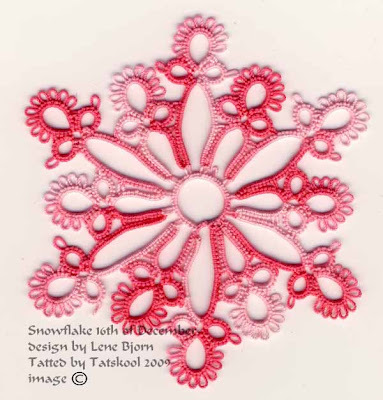 This is a very pretty easy to tat snowflake...provided that you concentrate enough! Shuttles loaded I was a good way round before I realised that I was didn't have enough picots left to join to to give me 6 tall and 6 short trefoils.....clang.....mmmm!!! since there are 6 tall and 6 short trefoils then I need 12 picots! Now of course this would have been obvious if I had been concentrating and not watching TV at the same time. The book had lulled me into a feeling of false security that all the central motifs have 5 picots and a false one. ...which actually would look great draped over a bauble....if only the central circle had been bigger.....which brings me back to the beginning again! By this time I was heartily sick of this colour....Oren Bayen...gorgeous teal green. A change of colour would do me good and it did. Looks beautiful doesn't it and I bet you didn't notice the mistake...yes another mistake. I ran out of picots to join to again...I was sure I had 12....if you look closely at the top right you will see the little blighter that got caught up in the previous bit of tatting. Nothing for it but to soldier on and MAKE another picot in the last stitches. Looks ok mostly. It measures in Oren Bayen 50 9cm. Thread amounts Sh1 11.5m if you don't RW after the central ring then Sh1 does all the work. Sh2 1m or less. This really looks like the end of the challenge for a bit. Christmas really did catch up with me and the rest of the family refuse to believe that it is only the 16th and wait a bit.....probably because their flight home won't wait!! 16 out of the 24 snowflakes, two thirds....not bad I suppose. 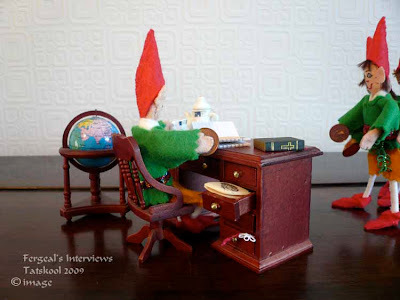 Trying to catch up on all the Christmas blogs is impossible but I am trying. The family just don't know the secret life their mum leads!!! ain't it wonderful. See ya tomorrow.... I had hope to photograph all the 16 snowflakes together but no time. I actually tatted a total of 32 snowflakes if you count the repeats! There are tatters out there who don't believe that it is really the 15th of December!!! If they are then I will not have finished my 24 Snowflakes before Christmas! But I keep going in the hope that they are wrong!! Today has been a hectic day in my house, finishing decorating to name but one minor thing. I nearly didn't make it to my computer for this post, so think yourselves lucky!! 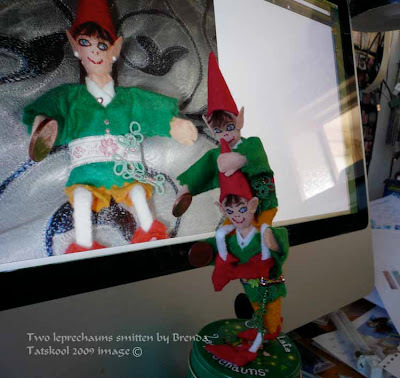 There are others who believe that there are tatting helpers in my house, they obviously don't know just how lazy two leprechauns egging each other on can be!! to give me a feeling of false security followed by similarly easy looking ones that are NOT. 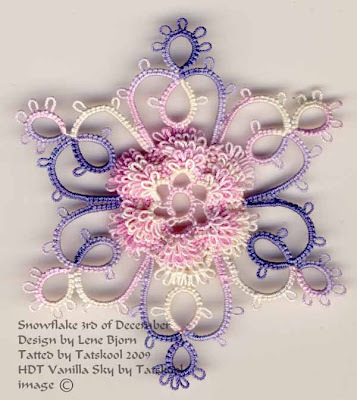 Lene's tatting is so immaculate in her photos, every picot is just so, and her chains all so even, that I am wondering how many dozens of times did she have to tat these to get a perfect one or can she do that every time! OK enough of that, time to show what I achieved. I can tell you that it looks a helluva lot better now that I have blocked it than it did before. 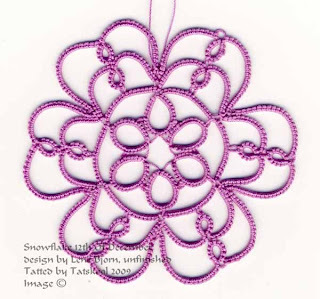 The tatting itself is easy. It is basically chains with rings thrown off, but it is so difficult to get those long chains to be smooth and even. Maybe practice would make perfect but no time to do that. That and getting the joining picots just the right length. Done really well it would be stunning. 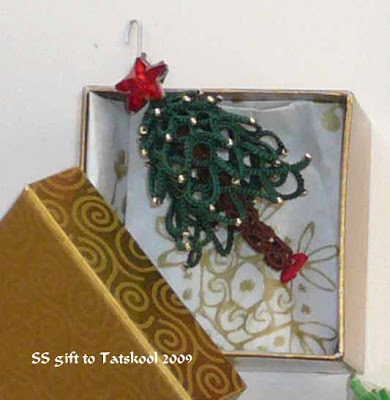 The thread is another Altin Basak 50. the snowflake measures 9.5cm again. Thread amounts Sh1 1m, Sh2 11.5m, sh2 does most of the work...or Sh1 if you don't RW when you come out of the center ring. In which case adjust thread amounts slightly. 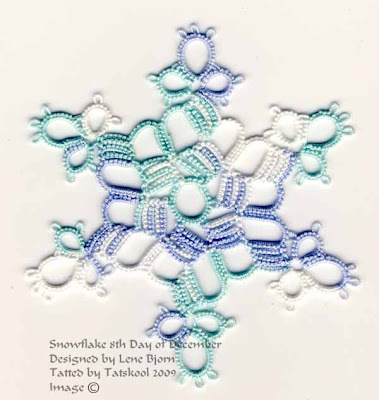 Today's bonus snowflakes...more of my favourite Dec 3rd..this one is just so easy and so stunning. I wanted to try it in Vanilla Sky. MY first one has a center of Raspberry Ripple and Real vanilla. You may or may not notice a glaring mistake...but I will point it out anyway! Major forgetfulness in the big ring at the bottom of the scan. 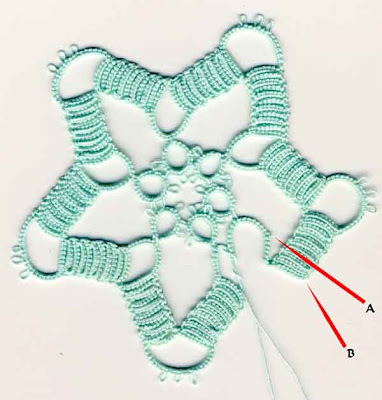 I get so used to tatting my picots in the central rosette with no stitches between them that I forgot not to! I was too far past it to even think of untatting so I said to myself who cares anyway! It's just hand made that's all. I don't really like the effect of the varig' center so I will use a solid colour. 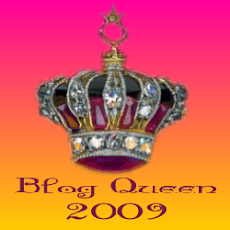 The choice was a pale pink from Vanilla Sky or a slightly deeper one. I chose the deeper one. Not sure that this was the right choice, need to do another with a paler center! On to tomorrow....still a week until Christmas!!! 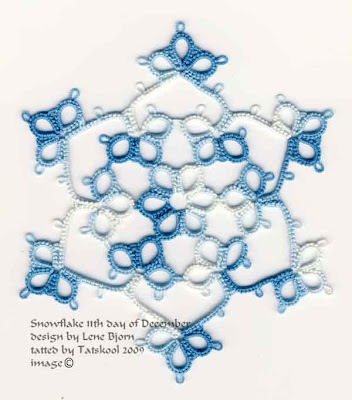 Snowflake number 12...yipeeeeeeeeee! Half way through the book. It's all down hill from here...or should that be uphill! This snowflake is a little beauty, one of my favourites. It was so pretty that I had to stop halfway and do a scan...it is perfect as it is. Add the final round and it is splendiferous. I think this is a design masterpiece. It was very easy to tat, nothing more difficult than one split ring if you want to do it all in one go. 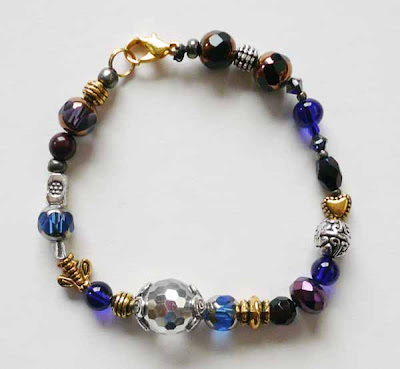 It would look gorgeous in different colours for the rounds, but a lot of hiding of ends. I tatted this in Coats 40 in a lovely medium purple. It measures 9cm. 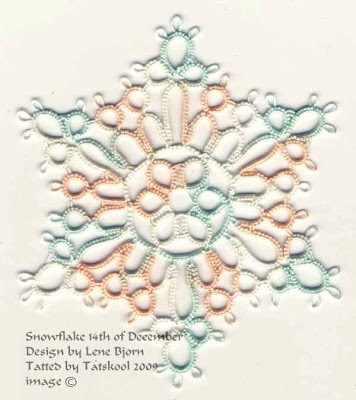 I really need to make all of these snowflakes in fine thread to make them suitable for the tree. Thread amounts, Coats 40. Sh1 9.75m, Sh2 3m. I finally finished decoration my big real Christmas tree. This year it has to be baby friendly, I put on only 2 glass ornaments and no little wire hangers like I normally use. A smaller tree than usual it had to be raised up...more baby friendly too. It took two milk crates to make a stable base I put all the cute decorations that a little boy will love to look at near the bottom, missed out all the tinsel and lammetta as it is such a pretty tree and then went to town with tatting. Over 600 little tiny lights and it looks so much prettier than you can see. 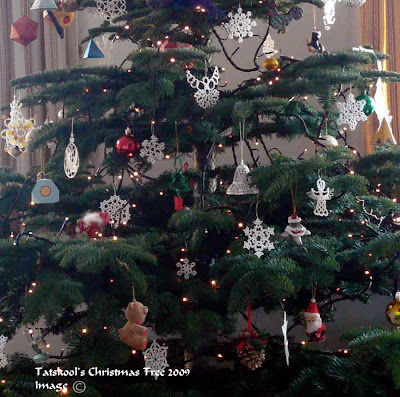 You will wonder why when I am tatting so many multicoloured snowflakes and then have a tree with nothing but white. Well white is still the best for a snowflake and they do show up so well against the green. 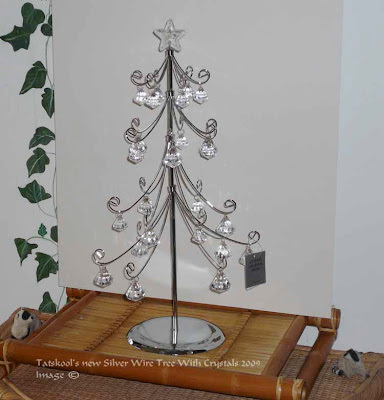 Upstairs I have also decorated my Silver Rainbow Christmas tree with total absence of white. 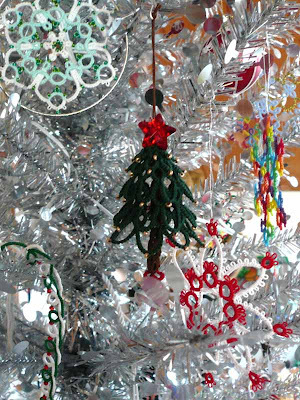 My antique feather tree is all white also this year...totally tatting....so all my white snowflakes are not on my big tree! .....but she remains my all time favourite. 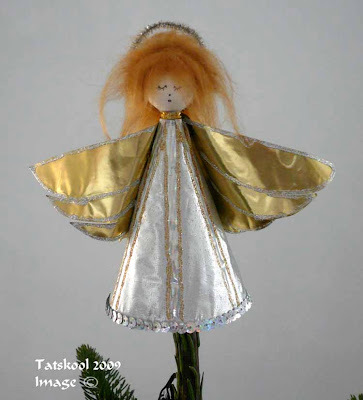 One year in Brownies we made a start for an angel. 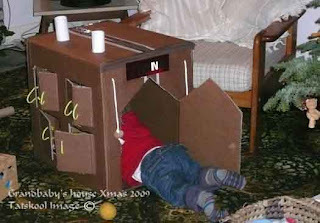 A cardboard cone with a cotton ball for the head, and told them to go away and decorate it for the following weeks party. The results were fabulous. This was my attempt with gold foil,holographic paper, glitter glue and sequins and a little angel hair with a pipe cleaner halo. Some of my favourite decoration on my tree are geometric shapes made out of thin card and decorated with glitter and sequins...I must show them to you sometime. 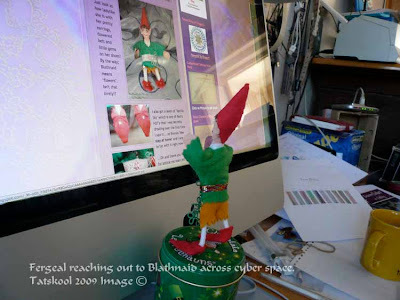 11th day of December and I am still tatting. I wish it really was the 11th, then I might have a fighting chance of completing my challenge. Snowflakes are beginning to get thin on the ground...tho it is just possible that we might have a White Christmas...how cool would that be....probably very. We have had almost a week of dry sunny weather, blue skies...but gradually getting colder. 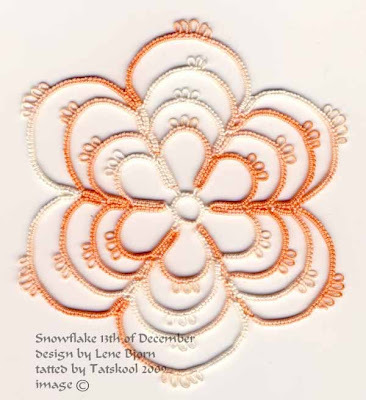 On to Snowflake 11...this was really very easy, if you can tat a trefoil then you can tat this, you can even avoid a split ring if necessary. ...the instructions say to make it in 2 rounds but since there are split rings...the 2 rounds are continuous...something she says in other patterns but not this one. I guess it's just happened in the translation from Danish. 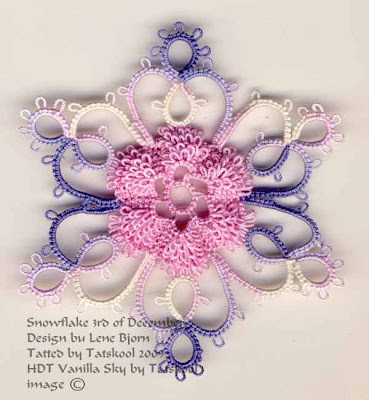 Pretty snowflake....don't like my colour choice much...a varig' Flora 20...looks better in the scan than in real life. A bit clunky in 20, next time I will make it in 30 or 40. 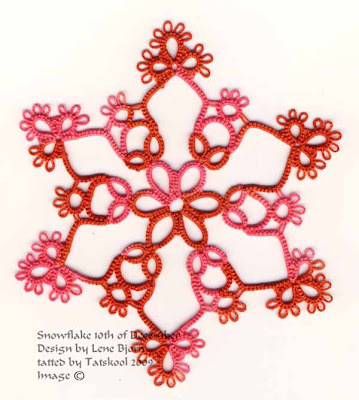 It measures 10cm....interesting fact is that if you tat a snowflake in size 20 it will be the same size as the diagram in the book! Thread amounts, Sh1 6m, Sh2 7. An extra treat today....look what I got in the post from my dear friend Sally from Tats Heaven....tucked inside the Christmas card was a simply divine be-jewelled butterfly bookmark designed by her very own sister. Hope to see ya tomorrow, better get down to it! Sorrrry! been a bit busy, trying to get Christmas sorted, finish the shopping, buy the tree (at long last), get it up and decorated for my tat party today with my lassies. Trying to make my tree safe and wonderous for a one year old...is that possible! 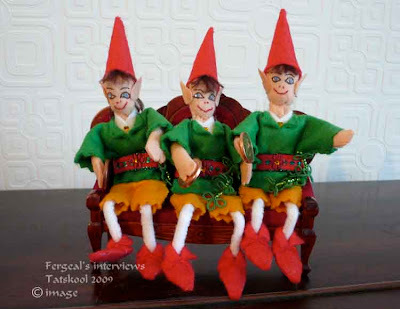 Such wonderful photos for Fergeal's album, he is so proud of his siblings...and jealous too. 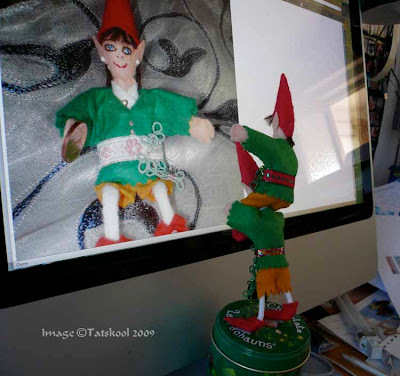 Back to reality and the next snowflake in my Christmas challenge. Day 10 was an absolute joy to tat. Isn't it beautiful, I love the negative space created by pulling those chains out to the side. I made this in a gorgeous colorway in Oren Bayen another soft 3 cord Turkish thread which comes in gorgeous colours. It measures 10.5cm and takes approx 12.5mm, can't give you the amount on each shuttle as had to do some shuttle switching to finish it, having put 7m on each shuttle. This is a definate must do again. Hope to see ya tomorrow. This is the last of the 'how on earth am I going to tat this one' snowflakes. That's not to say there won't be any more, but they all look do-able from this distance! This one took me 4 nights to get right, but I got there in the end. Tatted in one round, it goes in and out, up and down and round and about until you are dizzy!! Once you have figured out which direction you are going and where to join it's a doddle!! I did start off on my first attempt going the wrong way as I came out of the inner ring and ended up with my block tat lines lying the wrong way round...which turned out to be useless...so that was abandoned...especially after I then noticed that there were direction arrows. silly me. Once again the photo is the reverse of the diagram which doesn't help the confusion. Nice big print out, flipped over had to be made. The instructions are actually good with start arrow and follow up arrows. Loaded up with Flora 20 in a minty green off I went....at speed...too much speed not enough thinking! 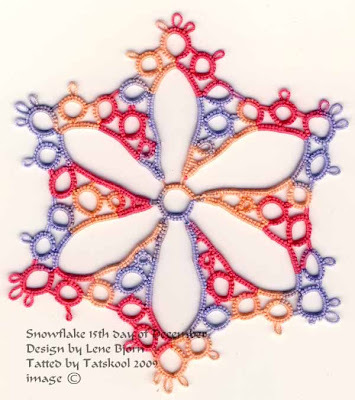 using Jane/Julie's method as in the last snowflake...I was half way round before I stopped to take stock and realised that....the picot shown by arrow A should have been joined to point B.....ooops! Looks simple doesn't it...just tie them together when I have finished...WRONG!! 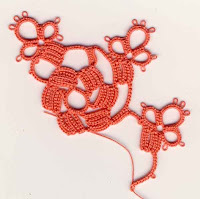 that would make one row of block tatting too many and I would end up at the outside instead of the inside! Well I was b...... if I was going to unpick all that way...so I will tat as far as I can and see what can be done. I cut out the offending chain and the first ring, stood on my head and tatted backwards to the beginning...or something like that. I did it anyway and it don't look half bad! Well apart from that blob of 4 ends tied off that you prob can't see and I won't look at!! Yippeeeeeeeeee! it's finished...it was easy really on reflection! they always are..that's why I should tat it again and enjoy it this time. So what colour do you suggest. This is just an approximation due to the mistake.....Sh1 9m, Sh2 8m...total 17m that's a lot of tatting! Joy of joys, tomorrow's pattern looks easy and gorgeous.....now don't peep and it will be a suprise! See ya! 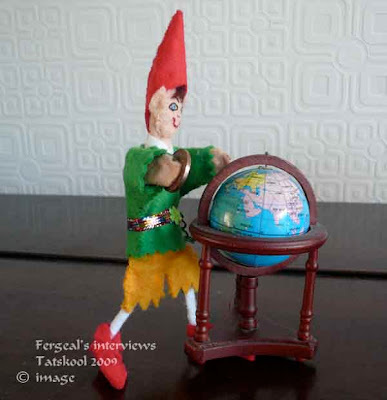 Glad that so many of you enjoyed Fergeal's exploits....it you enjoyed it do please leave a comment...they do show me that my efforts haven't just disappeared into cyber space. Only one guess as to which day of the week he held his interviews!! 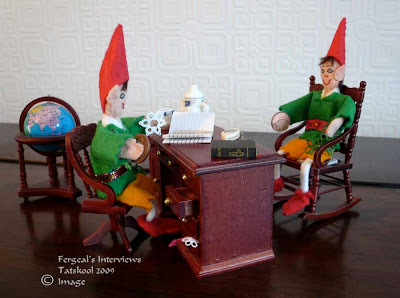 There will more adventures of Fergeal to come as he is getting big ideas above his station now that he has his office. This is the second of the snowflakes from hell that I was dreading. 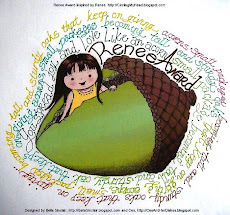 Sorry Lene...all your designs are superb. The finished snowflake is beautiful. But it had major trials and tribulations. I began with a solid colour in Flora 20....loaded up a shuttle connected to the ball.The instructions tell me that it is made in two rounds continuously...and I understand what she means...miraculously! 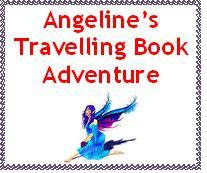 I am told where to start and given direction arrows and further instructions.... so all should go well!! But it didn't... I chose to do Jane's method of block tatting..that is one row of flipped stitches, followed by one row of unflipped stitches. Very easy once you get the hang of it and so turning at the end of a row. Jane has just reminded me that Julie Patterson used this method first, though Jane arrived at it independently. 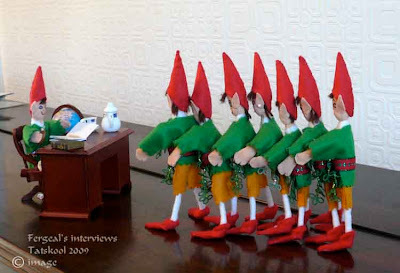 All went well until I suddenly realised that I had joined in the wrong place! Way to far back to unpick...and so I abandoned it...and learned! 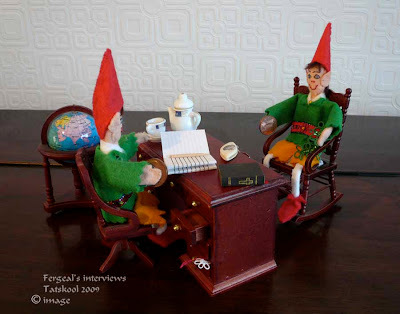 I do have one complaint about the presentation tho'! The photo is the reverse of the diagram...making it very difficult to compare where you are, especially when you are right left challenged. 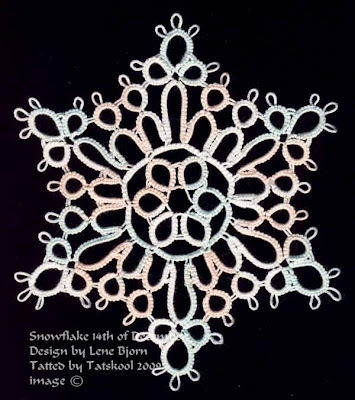 This wouldn't normally be an issue as most designs are symmetrical, but block tatting is not! So I had to flip it and print it out...big! 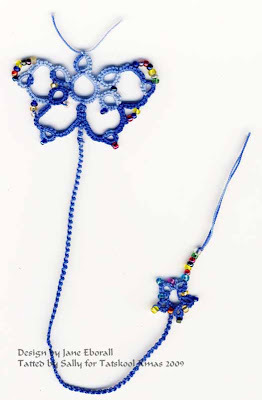 I also learned something else...NEVER, EVER try to do block tatting with a soft thread like Altin Basak. 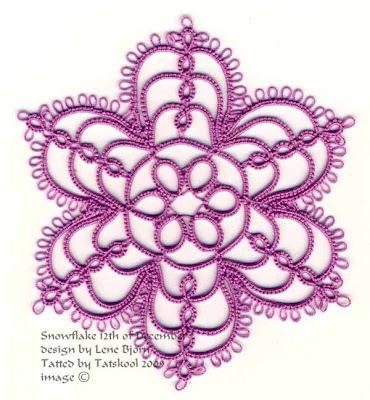 In block tatting there is a lot of joining thro' tiny spaces and inevitably the thread gets split at some point. With 6 cord thread you can usually smooth it back into a useable state, but with this the soft single pulled thread broke and became a lump of fluff!! Twice I had to join in a new thread next to the fluff....bet you can't spot it tho'!! I would tat this pattern again. I can think of so many threads that it would look pretty in. 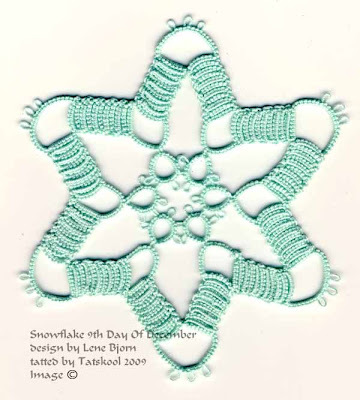 Using the shoelace trick method, the colouring in the block tatting would be continuous. Jane/Julie's method and switching shuttles method both produce contrasting stripes. Sh 6.75m, ball 4m...using Jane/Julie's method, other methods will take a different amount. I promised to show you what I bought in the Big Smoke on wednesday. This was my best find, something I had been looking for for ages...and there it was in a sale, half price! 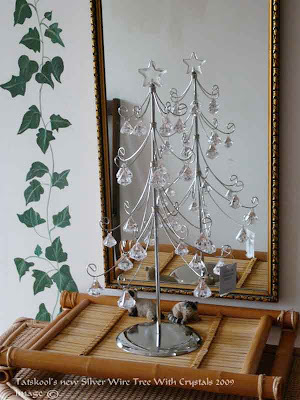 It's a tree about 18ins high, made out of silvery wire with crystals on each branch. Even tho' the crystals are made of plastic they really sparkle. It's a good job they are not swarovski as they are destined to be taken off! 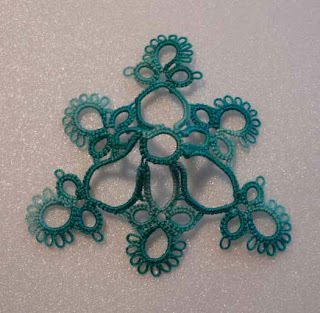 I put it in my hallway against a mirror so I will get to see two lots of tatting. 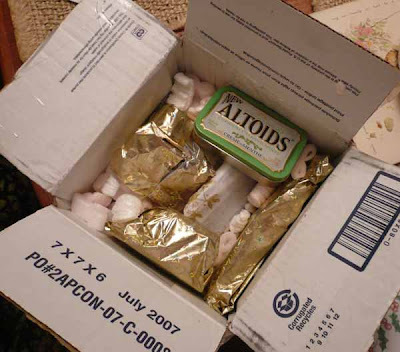 I can see this with hearts or easter eggs too. You can't see it very well in this photo so I have put a piece of card behind it. 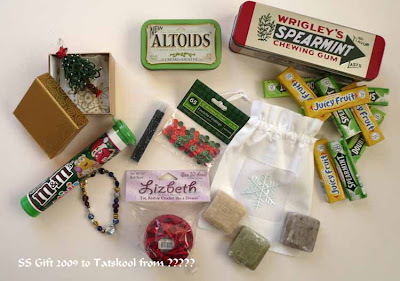 Addendum...this is the same Altin Basak thread that I used for the first snowflake of 3rd December that I sent to Diane. Pretty colour.